It was sunny and cloudy and I wanted to have a dramatic effect for this shot...converted to greyscale, levels, curves for extra contrast, the dodged and burned, some USM. 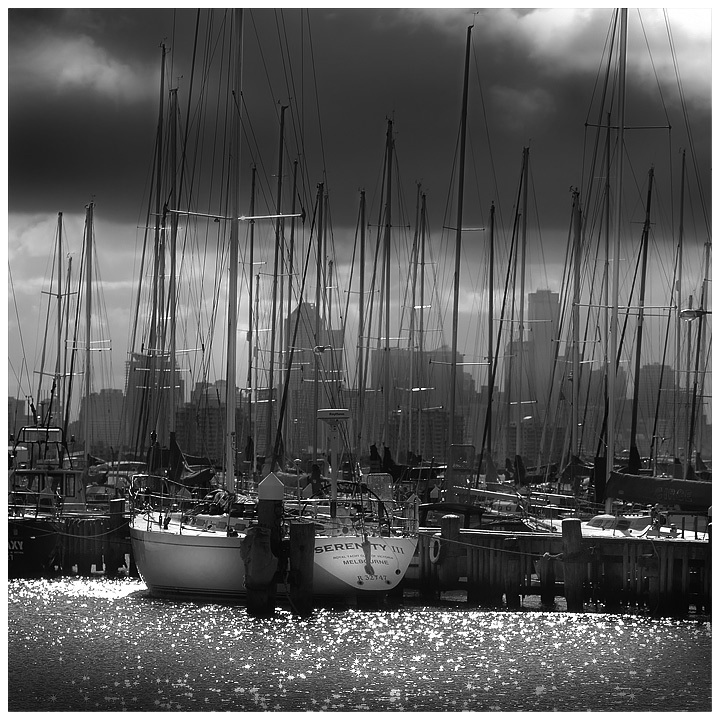 I thought a square crop would work for this, although I would have liked to have included the whole mast of the boats, but didn't frame the shot that way in the first place.USM, border, resize to glorious 720px. I so wish I had gotten to vote in this challenge. Great shot. Love the moodiness of the b&w. The lines are great and the background silhouette of the buildings is a nice touch. Glad to see this broke well into the 6s. If I could have voted it would have been a tad bit higher. Well done. I gave you a 9 on this one, the sky is very dramatic and that is what caught my eye. The thing I didn't care much for is the burning in on the boat, it is a bit to obvious. Awesome shot! Congratulations on a great score and finish! Yes, you can get a 6+ for this, beautiful shot! Well I gave ya a 9 and it was the first one I scurried off to see the scoring on, thought it had a shot at ribboning. C Novack, your comments are spot on, wish I could write comments like those. Love the light on the name of the boat. Terrific light. I might want either more or less space at the top. Nice pp and such, only doesn't give me enough feel of a storm. Maybe also if the frame was moved to our right a touch more. Sun, sky and mist conspire to create a great mood for this photo. Well conceived, captured and presentsd! I especially like how you've emphasized the sailboat and the juxtaposition of its name with the mood of the weather. It may be an optical illusion but it looks tilted to the left slightly. I would give it an extra point if this had been adjusted to correct the illusion. Among my top picks. Great shot and the name of the boat fits perfectly. good luck. Great contrast of masts and buildings. Beautiful - looks a little too dodged on the boat but overall very nice. Cool. I like the forbidding lighting. gorgeous tones, great lines. 9! Great use of lighting effects. The light on serenity really brings out this photo. nice shot. To me, it looks like it could have been levelled some. It may just be my eyes but my immediate perception was that it was tilted to the right some. Really busy, but I think it works. this is one of the more effective shots to make use of the enlarged canvas... there is much to like about this, from the sparkly inviting water, the forest of masts, and the hazy skyline in the background (which complement the masts) all work for me. the greyscale is very pleasing too. i'm not entirely sure about the very obvious area of dodging to draw attention to the titular boat. it feels forced and unnatural. but overall, the shot has ambience; you can easily place yourself in the frame, hear the sounds of the boats moving... very nice, and a good choice for the study. 8. Beautiful b/w. I could see this hanging on someones wall. nice light. Nice capture! B&W works really well here and the water sparkles really make this image. nice shot. all the masts add an intersting element. The simple monochrome with the highlight on the boat is just terrific. I particularly like the backdrop of the distant towers. I guess if I had to be picky then the fact that not all the masts are complete would knock half a point off in competition. Masterful. I like how the cityscape is in the background to this sea shot. well done...the highlights on the boat are very effective..
Beautiful scene, but the dodging on the Serenity is just a bit too obvious. nice photo. Looks like you may have dodged the boat title a bit too much. Other than that, awesome! Message edited by author 2007-07-27 00:16:36. IT LOOKS LIKE YOU BURNT AROUND THE BOAT...MAYBE A LITTLE TOO CONCENTRATED, PERHAPS BURNING A LITTLE MORE OVER THE ENTIRE BOAT WOULD HELP MAKE IT STAND OUT BETTER. I'm liking this very much. The square format really helps tighten the composition. Good choice in going with B&W because there is alot of elements in the photo that would get quite bogged down and overly busy if it had been in color. With the B&W the viewer gets to drink in the shapes and textures present in the photo. Love how the masts of the ships 'mirror' that of the city skyline. The sparkles on the water give a little magical feel to it. The boats in the shipyard offer a promise of escape from the hectic bustle of the city to open waters that are calm and enchanting. And how wonderful that that the mood of serene calm is best represented by the name of the boat that is perfectly illuminated: Serenity. Wow - interesting foreground/background interaction going on here. I like it. Proudly hosted by Sargasso Networks. Current Server Time: 04/23/2019 08:01:49 AM EDT.